I'm always curious to see if musicians have any other instruments that they play other than their primary instrument that they may be known for. Me personally, I started on the Trombone in Highschool, much to my parents disgust and surprise, who thought I would follow in my Dad's footsteps by learning to play the guitar. I did eventually take up the guitar, and found I had a singing voice to go with it. It may not be to everyone's taste, however please find below one of my cover songs, Whiskey & You. Re: What else do you play?? 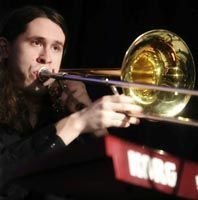 Bass and tenor trombones are my primaries these days, but I double all the brass and also play synthesizers. For most of my life, I've noodled and dabbled with any instrument available to me. Non-musicians are impressed. 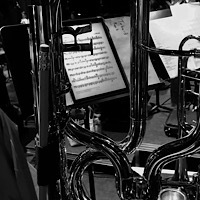 Low brass are the only instruments that I am willing to work to play them usefully. I suppose I might also say hand percussion. This gives me something to do in pop bands when trombone doesn't play. I'd like to sing more, but it takes time away from trombone playing. I'm learning the ophicleide. I imagine my neighbors are not pleased. I'm a doubler on alto, tenor and bass trombones and I play decent euphonium. I have played piano as an accompanging player (in my youth). I have also had more than one performing experience as a payed choralist. From all these instruments I have over time earned my living, at least partly. I have studied base and drums for about a year at the royal academy of music in Stockholm. It was a part of the education, and it came handy later when I worked as a music teacher. Back then I played trumpet, tuba, electric bass, synthesiser and drums besides the earlier listed if needed, but my skills on those latter instruments never became more than rudimentary, even though I worked for 13 years as a music teacher. I would not do any of those instruments in public today. 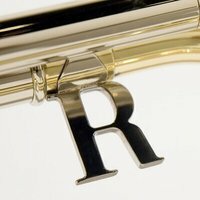 I play bass, tenor, and alto trombone regularly. Also tuba and euphonium very regularly. Other instruments... cornet, flugelhorn, percussion, drum set, piano (just chord changes), and a very bass upright bass. Tuba was my main instrument for many years. 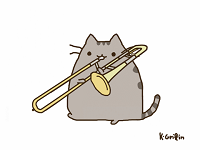 I'm still learning on trombone. I also play Euphonium and some bass guitar. 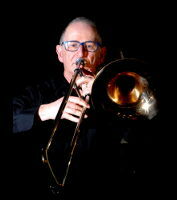 Trombone gets my time and focus now. Its a great instrument. 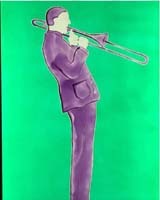 My primary instrument is trumpet, but early on it was trombone. 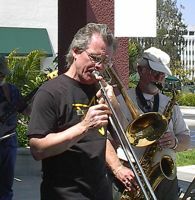 I played in several groups as a designated "player", either trumpet or trombone. I also play euphonium and bass guitar. Trying to learn guitar, but still in early stages though I have played it out once, led singing in a jail ministry. I don't play keyboard and was able to play the melody and sing at the same time. Too bad those attending were locked in. I've been a sax player most of my life, mainly baritone sax but I play all the other main ones, doubling clarinet and bass clarinet too. Oh, and a lot of bass trombone with some occasional tenor thrown in. Brass. Primarily a trumpet player, but ... everything from french horn to tuba, though my tuba is just an EEb. Latin percussion, of course, and BG vocals. Trumpet is my primary instrument, and I also play cornet and flugelhorn, with an occasional blow on shofar. I used to play piano acceptably, but now I just use a keyboard to work out chords and voicings. I used to play flute sometimes when my brass chops were done for the day, just to make more music. I found that after I got the fingerings down, flute was very easy to play. I eventually did this so seldom that I sold my flute. I don't miss it. I toyed with trumpet (gasp!). Yeah, but despite having good horns at my disposal, and the benefit of a few lessons, I still totally failed at trumpet. It wasn't for lack of trying. I practiced religiously, day after day for many, many months...actually for over a year, daily! Alas, I still could not stay above top-line G or maybe A with any facility. It seemed like my embouchure just didn't have the right combination of flesh, teeth, tension, etc... Plenty of air. Air was never the problem...but I got bupkis for all my effort. I enjoyed it, even tho I could never really play in public. 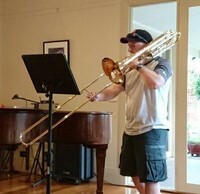 Back to trombone I went, and all was right with the world again. I play drum set, ukulele, bass guitar, im learning soprano trombone and trumpet, im planning on getting an alto trombone, I play a bit of piano, and flute most of these except drums, ukulele, and bass I'm not very good at and just learn them for fun. I think learning more instruments is a great way to add knowledge to your brain, especially if you want to compose music. Played, professionally, Trumpet, French Horn, Flute and Saxes. Dabbled on Trombone, Guitar, Recorder, Feadog, Ukulele. Learned rudiments on Violin, Viola, Cello, Bass, Piano.